Bulletin of The Mineral Research and Exploration is a peer-reviewed scientific journal of earth sciences which has been published since 1935. 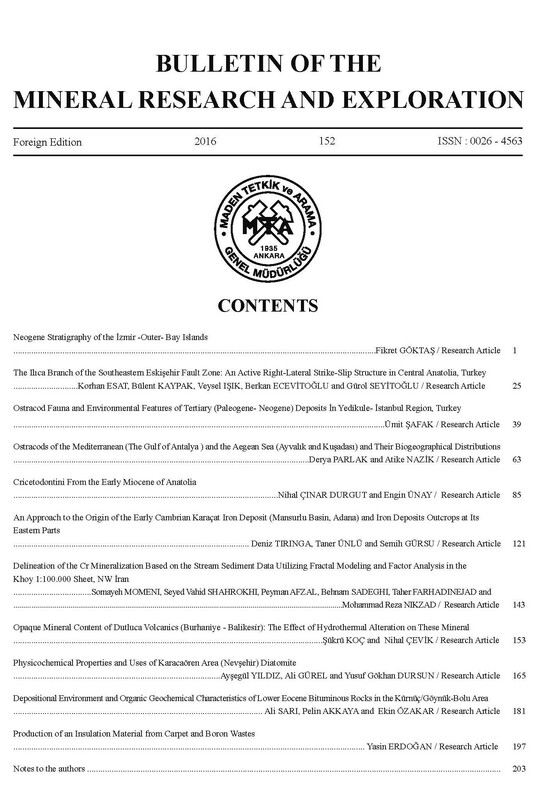 Bulletin of the Mineral Research and Exploration publishes original scientific research and review papers, discussion/reply and short notes about all aspects of the geosciences. It is published in both Turkish and English languages twice a year. Publication in this bulletin is free of charge (there are no submissions charges, article processing charges, and publications fees). All new submissions to the Bulletin of the Mineral Research and Exploration are checked for plagiarism by intihal.net software to verify the originality of the papers before publication. Papers that contains any form of plagiarism or self-plagiarism will be rejected. Bull. Min. Res. Exp. is scholarly open access, peer-reviewed journal that is freely available online to access and download. Non-commercial use and distribution in any medium are permitted, by ensuring that the author and the journal are properly accredited. Bull. Min. Res. Exp. is indexed and abstracted in TR DİZİN, Thompson Reuters Master Journal List, Emerging Sources Citation Index (ESCI), Georef, Geological Abstracts, Mineralogic abstracts, DOAJ, Scopus database.